If you live in the United States, today is Thanksgiving. It’s a holiday that’s all about eating turkey, and then lying around like cushions for the rest of the day as the tryptophan crosses into our brains, raises our serotonin levels, and puts us all to sleep. But before we all nod off into mini-comas, I wanted to to talk a little bit about the Thanks part of this holiday. First of all, at the very top of the list, I am thankful for my health. In fact, I think that occupies spaces one through ten. 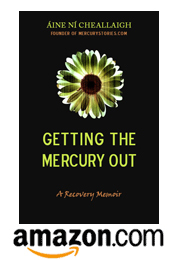 As anyone who has been through mercury toxicity can tell you, health is the top priority. Without health, it’s very hard to be present to enjoy all of the other wonderful people and experiences in our lives. Which brings me to spaces eleven through, I dunno, a hundred on my gratitude list. I am so grateful for the people I have in my life. Friends and family, here in town and far away, I feel so lucky to be a part of this web of connection. And this web includes all of my readers too. It’s been a year since I started this blog, and just six months since I published Getting the Mercury Out. Putting my words out into the world has been such a great experience–because people have written words back! I am so thankful to everyone who finished reading my book and thought, I’ll just drop her a line and let her know how important this story was to me. It feels very nice to be constantly reaching out to–and hearing back from–people all over the world who are having parallel experiences to mine. It makes me want to keep on reaching out. So I’ve got 50,000 words of a rough draft of a novel sitting on my desktop. It’s set in the year 2050, a science fiction story about what our world would be like if mercury toxicity was far more common than it is today… Sounds chilling, but I’m really enjoying spending time with all the mercury toxic characters I’ve created.